1909-11 T206 White Border - Joe Doyle N.Y. Nat'l Variation Card. The fabled "Doyle/hands above head" type is normally seen without the "Nat'l" printed after "N.Y." at the bottom of the card. 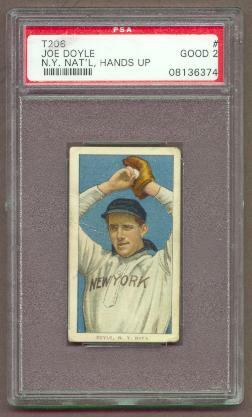 In extremely rare instances (less than 10 actual examples have been seen) the card is found with "N.Y. Nat'l" printing to the right of Doyle's name. This particular example is fresh to the hobby, having been recently found by a renowned East Coast dealer in a group of a few hundred tobacco cards. In over 20 years of buying and selling tens of thousands of T206 tobacco cards this is the first actual "Doyle" that I have held in my hands. It is much scarcer than the famous "Honus Wagner" card and even rarer than the very elusive "Ty Cobb with Ty Cobb reverse" card. The "N.Y. Nat'l". is printed perfectly across the bottom, bold and evenly-toned without a trace of "fade". The card has been authenticated and graded GOOD 2 by PSA. The condition of the card appears somewhat better, with beautiful color and focus, some general overall wear with two light to medium horizontal creases on the left side, and a 1/4 area of paper out of the reverse. Out of the holder we would grade this card Good to Very Good condition with very pleasing visual appeal. Of the very desirable "Big Five" T206 tobacco cards, the "Doyle" variation is truly the "rarest of the rare", the gem that even the most advanced tobacco collectors still have on their mostly crossed-out want lists.